This is a short teaser for my debut short doc titled “From Tunisia to Syria: Joining the Fight Against Bashar al-Assad.” It premieres on February 7th at 8:20 pm on NYU campus (19 University Place, New York, NY, 10003). When workers at Daily Cleaners on 46th street on the East Side of Manhattan say that they dread the last week of September, it isn’t because summer is ending. Their apprehension is due to yet another United Nations (U.N.) General Assembly beginning. During this period, political leaders from the U.N.’s 192 member states arrive with their diplomatic entourage in tow to voice their opinions on the world stage. 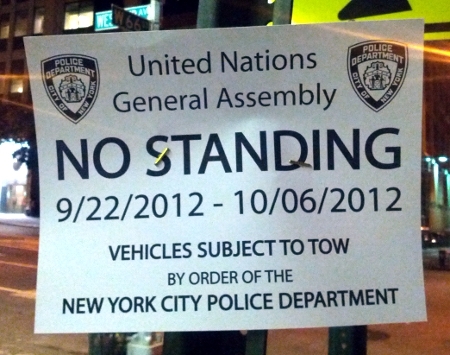 As they do so, their security needs demand that the New York Police Department (NYPD) wreak havoc on both pedestrian and vehicular traffic in the area, imposing restrictions that can cause huge headaches for business close to the U.N.
“The General Assembly affects us greatly. Every year, it’s the same thing. When the police shut down 2nd Avenue and 46th Street, it’s very bad for us,” says storeowner Monica Lee, who didn’t hesitate to share her displeasure at declining profits. Everyone in the neighborhood doesn’t share Lee’s frustration though. Just one block west, on the other side of 2nd Ave, where the police barricades on roads leading to the U.N. end, Steve Dobos of Artisan Cleaners is sporting a much happier demeanor.